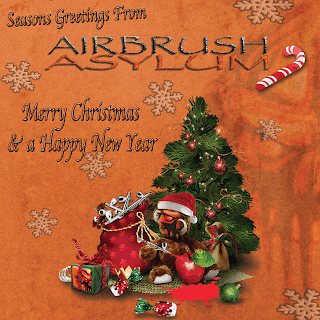 Seasons Greetings from Airbrush Asylum. To all of our Customers, friends and family we would like to take this opportunity to Thank-You for your continued support, and wish you and your families a safe and Merry Christmas and a prosperous New Year. 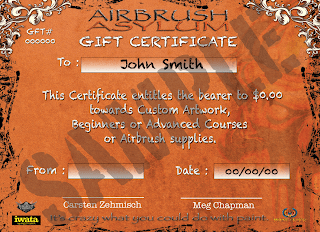 Airbrush Asylum Gift Certificates, NOW available. Stuck for a unique Christmas Gift idea, or are you looking for a really unique present that gives your partner, friend or family member a fantastic choice ? 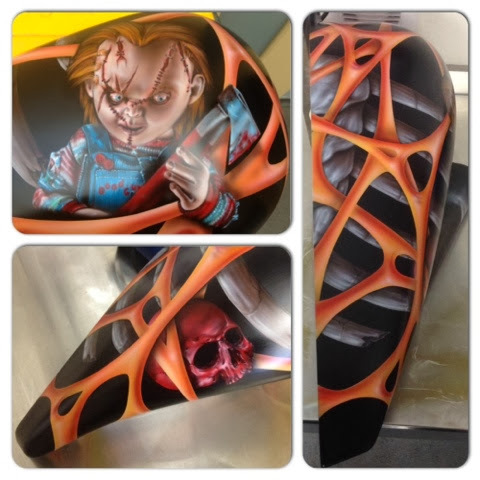 Kustom Paint and Airbrush Artwork. Introductory & Advanced Airbrushing Courses. We can either print and post your certificate or email it directly to you, the certificate does NOT expire so you can enjoy our services whenever it is convenient for you. 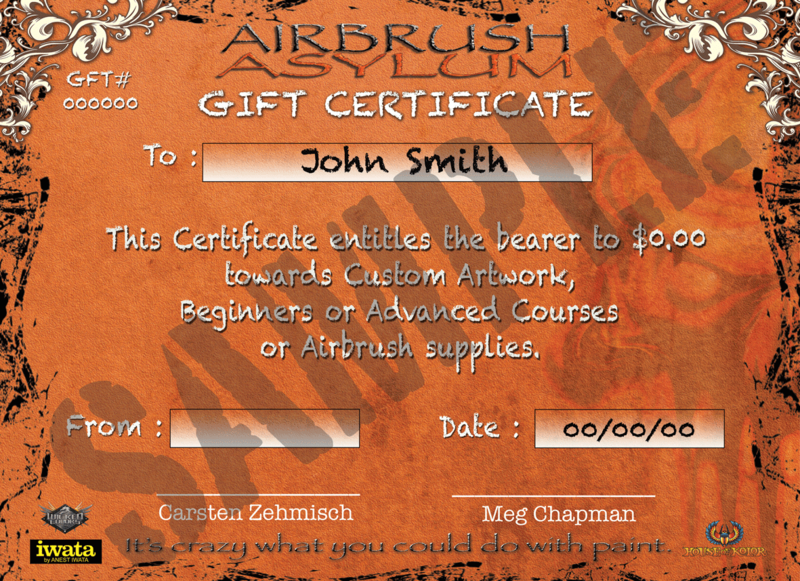 For more info please email us @ meg@airbrushasylum.com.au or visit our website www.airbrushasylum.com.au and fill in our online form marking the description as Gift Certificate. 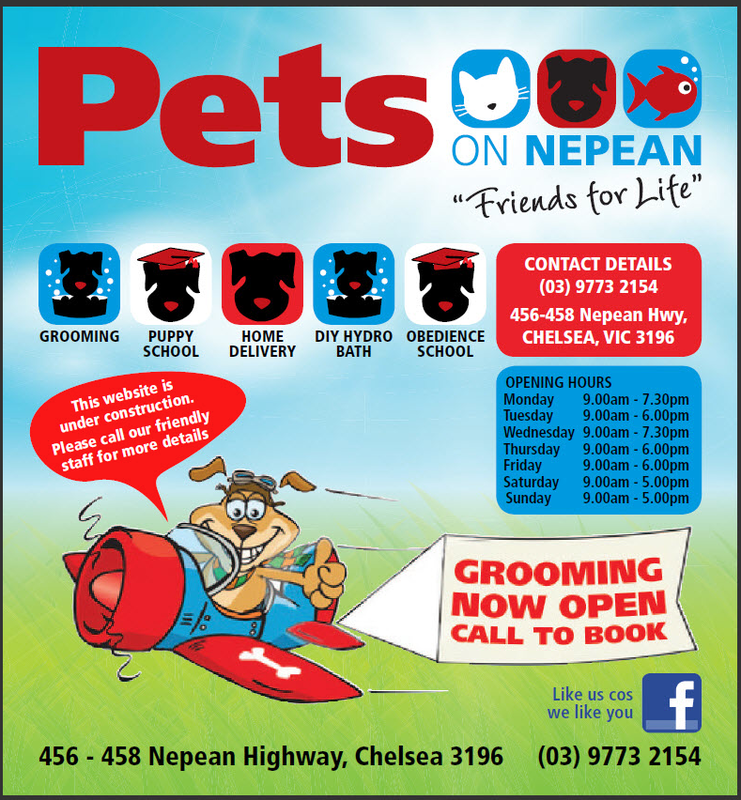 We accept Credit Card payments over the phone and EFT payments if that is your preferred method. Visit us today @ Pets On Nepean﻿ from 1pm onwards, where we will be airbrushing Pet Portraits. A great present for Christmas and a donation from each canvas sold goes to Oscar's Law﻿ to help abolish puppy farms. We should be there for a few hours, so if you are in the area then feel free to drop in. Chucky half tank complete, ready for clear. We have been busy working on some exciting new half tanks, which will be mounted on one of our display stands located in Motorcycle dealers in Melbourne. 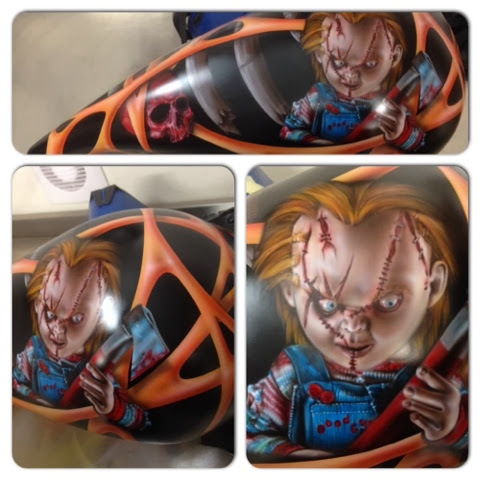 This particular tank has a Chucky theme, the evil doll that starred in the hit horror classic 'Childs Play'. The mural itself took many hours rendering all of the gashes and stitches in his face and the fabric on his jumper and outfit. 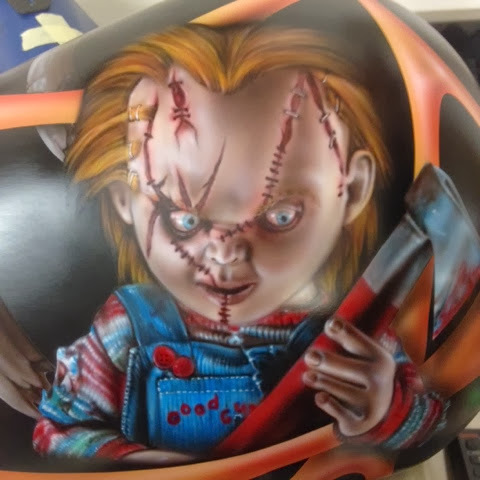 After the Chucky mural was complete, we masked up him and the skull and began sketching out the stretched skin and ribs that will frame the murals, the skin alone took nearly 1 day to complete.